Quantitative Ultrasound (QUS) offers you portable and accurate technology for measuring bone properties at the heel without the use of ionizing radiation. When measured at the heel, QUS helps you accurately predict fracture risk for post-menopausal women. Background.Reduced bone mineral density (BMD) is associated with renal osteodystrophy and osteoporosis in end-stage renal failure patients. Dual-energy X-ray absorptiometry (DXA) is the standard non-invasive method to assess BMD, but is not always widely available. Quantitative heel ultrasound (QUS) is a mobile, relatively inexpensive, easy to perform and radiation-free method which can predict fractures to the same extent as DXA. This study assessed the usefulness of QUSvsDXA in determining BMD in chronic haemodialysis patients. Methods.Patients had their BMD at the hip and spine measured by DXA. QUS of the left heel (CM-300) measured speed of sound (SOS). Correlations between DXA and QUS parameters were calculated. Receiver operator characteristic (ROC) curves were plotted for SOS and used to define cut-off points for calculating sensitivities and specificities for SOS. Femoral neck BMD was applied as the standard for diagnosing osteoporosis (T≤−2.5) and osteopaenia (T>−2.5 and ≤−1) by WHO criteria. Conclusions.DXA and QUS parameters were significantly correlated. However, sensitivities and specificities of QUS parameters were not sufficiently high for QUS to be used simply as an alternative to DXA. The relatively high negative predictive values suggest that QUS may reliably screen out patients unlikely to have a BMD in the osteoporotic range. The relatively low positive predictive values, however, mean that subjects classified as osteoporotic using QUS require further investigations such as DXA to confirm the diagnosis. Brand Furuno Electric Co. Ltd.
Aarna Systems And Wellness Pvt. Ltd. is an Importer and Exclusive Indian Distributor of Ultrasound Bone Densitometer, Portable Bone Densitometer, Bone Mineral Density Measuring Equipment, Body Composition Analyzer, Central Dexa Bone Densitometer, Portable Dexa Bone Densitometer and Total Body Dexa Bone Densitometer. Onsite Service Support in Warranty, AMC and CMC. 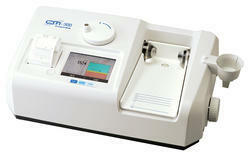 Ultrasound Bone Densitometer CM-300 measures bone density of human heel using ultrasound. The result is printed out with graph format chart from a built-in printer. Also adjustable Foot Plate (5 levels) and Temperature Compensation feature provides accurate results. With easy-to-use interface of the color touch screen, CM-300 is most suitable for screening test of osteoporosis. Uses radiation free ultrasound technology, safety for human body is ensured.